I have spent rich, full days exploring the treasures showcased in these significant cultural repositories, and I have returned to some of them for subsequent visits in later years. Only once, though, have I spent two consecutive days in a single museum, and that was last week in the MOTB. I appreciated every minute and will return the next time I am in D.C. Our nation's capital, despite its seeming political dysfunction, is now an even more attractive travel destination. I consider myself something of a museum aficionado, but I am currently a dues-paying member of only one museum on the planet - the MOTB three blocks from the U.S. Capitol. What is so special about the MOTB besides the delicious Near Eastern food served on the 6th floor Manna Restaurant? It is not the lavish architecture, although that is stunning. It is not the ubiquitous technology, although that is captivating. It is not the vast collection, although that is monumental. What I profoundly love at the MOTB is the spirit, the mission, the sheer joy of the place. These are people who read, live, and celebrate the Bible. This brand-new world-class facility is just the impressive infrastructure inviting visitors to engage the living Word John 1:1. This is much more than a museum. I felt like I had come home. Our Book of Mormon Central delegation went to Washington D.C. to learn from experts so we can more effectively share the Book of Mormon with the world. The MOTB is not preachy or judgmental. It honors scholarship but communicates in the vernacular. It exudes quality but invites hands-on participation. 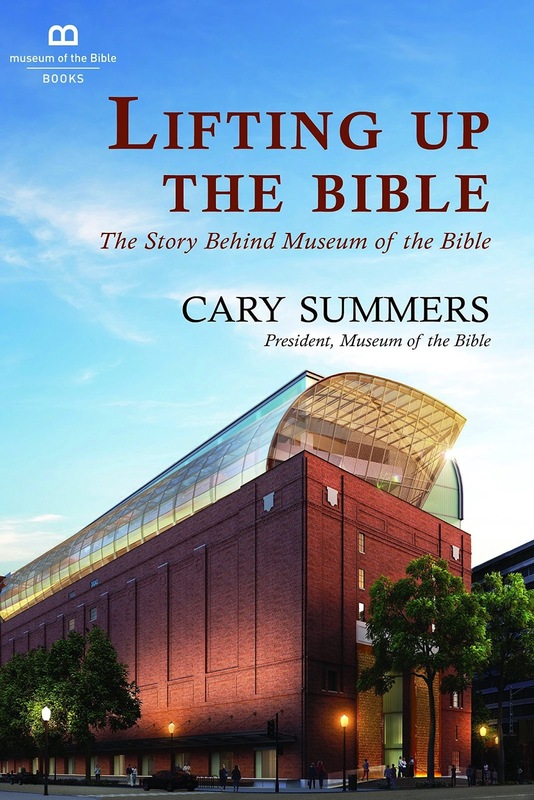 It showcases the history, narrative, and impact of the Bible but eschews interpretation. This brilliant approach avoids divisiveness and simply lets the Book speak eloquently for itself. 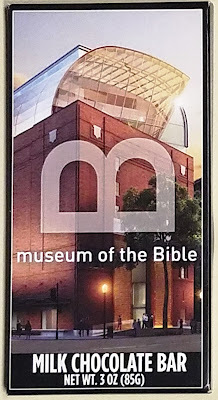 Prominent MOTB partners include Israel Antiquities Authority, Vatican Library and Museums, and Ets Haim Jewish Library in Amsterdam, all of whom currently have traveling exhibits in the facility 2 blocks from the Smithsonian's popular National Museum of Air and Space. Museum President Cary Summers has significant theme park experience and serves as CEO of the splendid Nazareth Village in Israel. The MOTB was originally planned for Dallas. New York City was also briefly considered. Its headquarters are actually in Oklahoma City where founding family Steve and Jackie Green (owners of Hobby Lobby) reside. 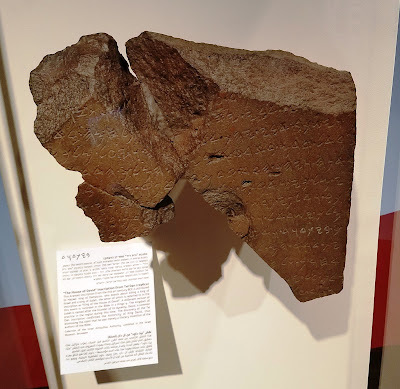 Parts of the Green collection of Biblical artifacts traveled the US beginning in 2011 before going to the Vatican in 2012 and Havana, Cuba in 2014. The Washington D.C. property atop the Federal Center SW Metro station was acquired in 2012 and the museum opened to the public on Friday, November 17, 2017. 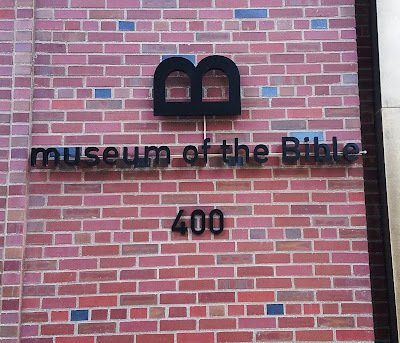 Insightful design is everywhere in the MOTB, beginning with the logo which artfully combines the letters "B" and "M" into a visual representation of Moses' tablets from Sinai and an open book. The capitalized "Bible" emphasizes primacy. 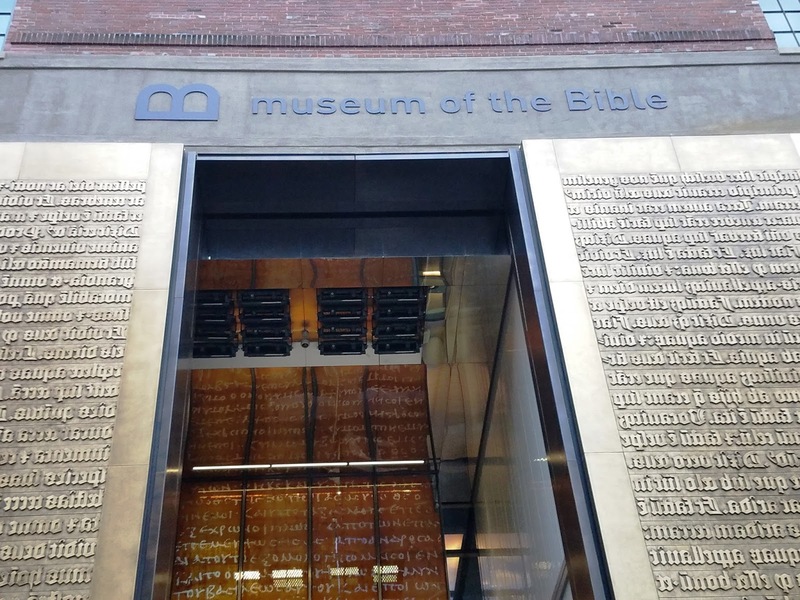 The MOTB grand entrance features Genesis 1 from the 1454 - 1455 Gutenberg Bible in Latin on massive brass plates that cost $3 million. The plates flank a 32 foot high art glass panel from Germany representing the Bodmer Papyri with Psalms 19 etched in Greek. One of the MOTB treasures is a Bodmer Papyri fragment containing the 19th Psalm. As with all images on this blog, click to enlarge. 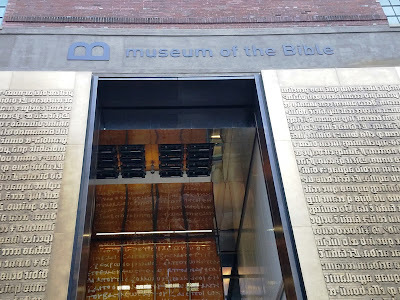 Stepping off the sidewalk into the museum one literally engages the words of the Bible. A small touch illustrates the immaculate attention to detail one finds throughout the MOTB. On Monday, December 11, 2017, my wife, Shannon, and I were privileged to tour the new T3 and T4 buildings at the Provo Missionary Training Center (see the article "Mesoamerican MTC Mural)." They are among the finest structures the LDS Church has ever built. 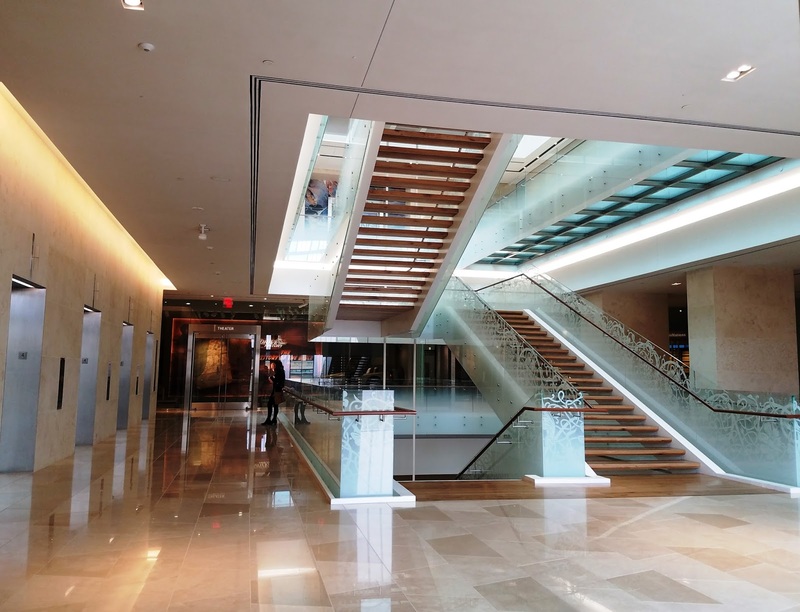 They feature grand staircases flanked by translucent glass. As I walked up the stairs, I thought to myself "These are almost identical to the stairs in the MOTB" where I had been three days before. Except for one thing. The glass panels adorning the MOTB stairs are etched with a vine design reminiscent of the beautiful illuminated Bible manuscripts lovingly painted by monks and nuns in the Middle Ages. This kind of delicious embellishment doesn't just happen when an architect interacts with a building committee. It only happens when a design goes through an iterative process of refinement with multiple inputs supported by an almost open-ended budget. The PRD Group, Chantilly, VA who have worked on the Smithsonian National Museums of American History and Natural History. BRC Imagination Arts, Burbank, CA who have worked on the Abraham Lincoln Presidential Library and Museum, Disney's Hollywood Studios Orlando, and Universal Studios Japan. C&G Partners, New York City, who have worked on the US Holocaust Memorial Museum, the Metropolitan Museum of Art, and the Museum of Jewish Heritage. Jonathan Martin Creative, Nashville, TN who have built themed attractions for megachurches and destination venues such as The Holy Land Experience, Orlando. Coldwater Media, Palmer Lake (Colorado Springs), CO who produce the popular "Drive Through History" series featuring Dave Stotts. The result is part museum, part experiential theater, part interactive video game, part theme park adventure, part movie studio tour, and part historical re-enactment with actors in period dress. My colleagues were as anxious as I was to return to the MOTB for a second day. There were many more exhibits we wanted to experience, and some we wanted to see a second time. The MOTB is grounded in reputable scholarship. Wandering through the exhibits, one sees influence from Oxford, Cambridge, Hebrew, Duke, Baylor, Pepperdine, Trinity Western, and Bob Jones Universities among many others. A "scholars initiative" was created early in the museum development process to do original research on artifacts in the collection. One result is the book Dead Sea Scrolls Fragments in the Museum Collection published in 2016 by Brill. The three editors are Immanuel Tov (PhD 1974, Hebrew University), Kipp Davis (PhD 2009, University of Manchester), and Robert Duke (PhD 2006 UCLA). While we were at the museum, Hershel Shanks was also there consulting with the content and curatorial staffs. Shanks founded the Biblical Archaeology Society and is editor emeritus of the noted Biblical Archaeology Review (BAR). 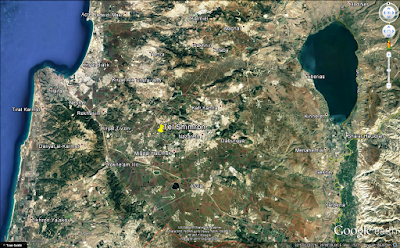 One exciting new museum project that came out of the scholars initiative is a working archaeological site - Tel Shimron about 8 kilometers west of Nazareth on the edge of northern Israel's Jezreel Valley. The site was occupied over a 5,000 year span. It is mentioned in Joshua 19:15 as part of the land allotted to the tribe of Zebulun. Scholars estimate the site will be a viable dig for 25 years. The team heading up the excavation worked together previously at Ashkelon. Directors include Daniel Master (PhD Harvard), Mario Martin (PhD University of Vienna), and Adam Aja (PhD Harvard). 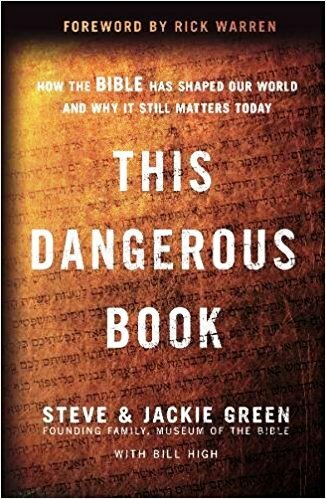 Does the MOTB try to prove the Bible's historicity? Not really. It does display replica artifacts that attest the Bible's historical accuracy such as the Tel Dan Stele referencing David as a monarch. The original of this artifact, dated to ca. 870 BC, is in the Israel Museum. The MOTB does not hit you over the head with hard-sell advocacy. It is clear to visitors that the MOTB assumes the Bible is authentic ancient history, but artifact descriptions are appropriately nuanced, scholarly protocols are followed, and the text is genuinely respected even with its ambiguities and apparent contradictions. A note about MOTB replicas. They are about as good as science and technology can make them. At lunch on our first day in the museum, Daniel Smith exulted "The Isaiah Scroll replica is actually sewn with thread!" 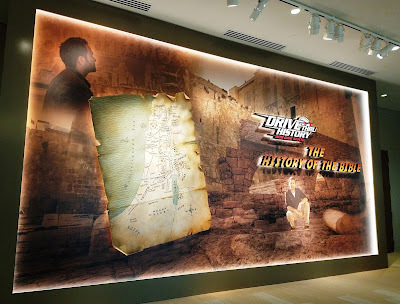 The replica on display in the Israel Museum is a photographic reproduction showing only an image of thread. Bethany Jensen works at museum headquarters in Oklahoma City. She graduated from BYU's Ancient Near Eastern Studies program with an archaeology emphasis. A classmate of Jasmin Gimenez, Bethany graciously facilitated our meeting with Seth Pollinger, Director of Museum Content, and members of his staff. A 1979 LDS Bible (King James Version) is on display on the 4th floor. This is the edition largely prepared by Ellis Rasmussen and his students working under the direction of Elder Bruce R. McConkie and the Church's Scripture Publication Committee. With only minor subsequent revisions in 2013, this is the English language Bible we use in the Church today. An 1867 Plano, IL edition of the Joseph Smith Translation (JST, aka "Inspired Version") published by the Reorganized Church of Jesus Christ of Latter-day Saints (now Community of Christ) is also on display on the 4th floor. The JST manuscript remained in Emma's possession after Joseph Smith Jr.'s martyrdom in 1844. The Reorganized Church, active since 1852, began operating under Joseph Smith III's leadership in 1860. The original of Arnold Friberg's "The Prayer at Valley Forge" is on display on the 2nd Floor. An armed guard stands watch about 5 feet away from this majestic piece. Prints of this work are common, but it was a thrill for me to finally see the large-format original. In general, we were beyond impressed. This is probably the finest museum on the planet in 2017. We expected a little sloppiness here and there - some mis-characterizations, over-claiming, obsolete scholarship. We found none. We expected immersive learning experiences. The MOTB exceeded our expectations. All three of us were enthusiastic bordering on ecstatic about our two-day experience. We highly recommend the MOTB. At the point where the Bible in America exhibit begins with Columbus and Saint Augustine, FL, we would have liked to have seen a little more content from Latin America. For example, by the 1540's portions of the Bible were already translated into the K'iche language of highland Guatemala. The museum displays a copy of the Reina Valera Bible. It was almost as influential in the Hispanic world as the King James was in English. We suggested they might want to use the terrific video the Church produced about the fascinating history of the Reina Valera. Where the museum treats Julia Ward Howe and her "Battle Hymn of the Republic" we would have liked to have heard the Mormon Tabernacle Choir singing their signature song. Ditto the "Hallelujah Chorus" from Handel's "Messiah." Wouldn't that be fun - MoTab in the MOTB? The MOTB is fairly superficial when it comes to the Temples of Solomon and Herod. The Academy for Temple Studies, combining resources from USU, BYU, and USC together with Margaret Barker's UK group, could possibly be of assistance in this area. The Bible gives short shrift to women and the MOTB reflects that. We suggested they may want to take a look at Julie Smith's upcoming volume on the Gospel of Mark in the BYU New Testament Commentary series as one example of the excellent work being done by LDS female biblical scholars highlighting feminine issues and perspectives in the text. We suggested signage linking Arnold Friberg and Cecile B. DeMille's "The Ten Commandments." Friberg's artwork is all through the movie. We also let Seth and his team know about the Cecile B. DeMille archive at BYU. Augmented reality (AR) and virtual reality (VR) are promised, but not yet much in evidence in the museum. We showed one example of the good work being done by the BYU Virtual Scriptures group in association with 4th Wall. We would have liked to have walked out of the museum with suggestions for further engagement - web sites, curricula, quality videos, etc. How much has all this cost? The MOTB has raised about $700 million to date and plans to raise another $300 million by 2019. Admission to the museum is free, although they are not shy about suggesting donations. Every museum memorializes major donors. The MOTB also has a "million name wall" where donors at all levels are recognized in microscopic calligraphy with an accompanying digital index. This 3D model of the museum is helpful for context. After two days on site, I greatly appreciated the MOTB. Returning home, I read Cary Summers' Lifting Up the Bible: The Story Behind Museum of the Bible. My appreciation grew. I then read Steve & Jackie Green's This Dangerous Book. My appreciation grew even more. 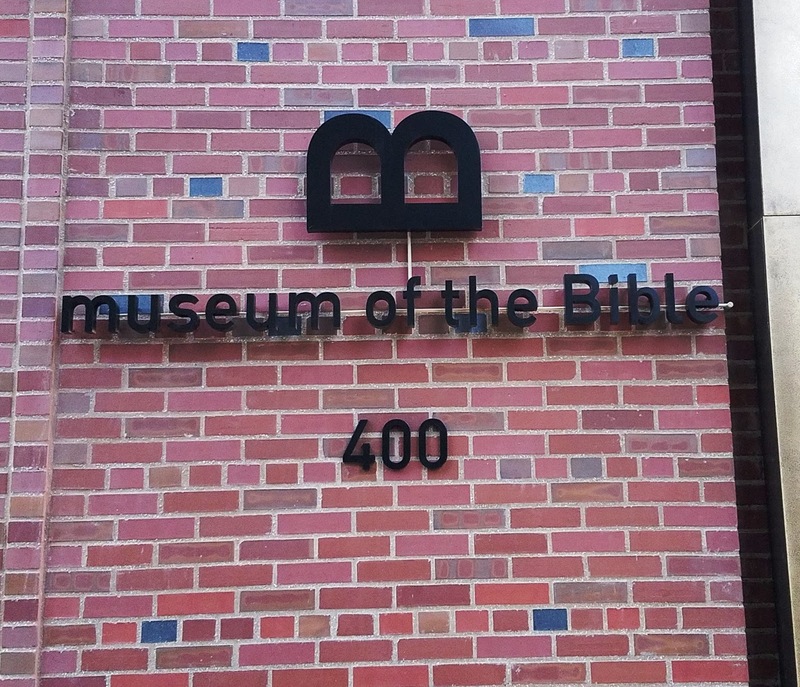 The Museum of the Bible is directly fulfilling the prophecy in 1 Nephi 13:19-20. Much of the controversy that has dominated mainstream media coverage is unfounded. This is an "innovative global educational institution" whose mission is to "invite people to engage with the Bible." I hope we as Latter-day Saints get excited to "experience the Book that shapes history." One vignette was choice. The MOTB has a marvelous exhibit on biblical translations. An older fellow in a wheel chair asked if they had the Bible in Hdi, a language spoken in Cameroon and Nigeria. He explained that his daughter had helped translate the Bible into Hdi. A docent pulled the Hdi Bible down from a shelf and handed it to him. A tear streamed down his cheek as he opened the book and saw his daughter's name in the acknowledgements. Those of us nearby broke out in spontaneous applause.